The top three knobs allow to set the gain for each fuzz : Fuzz face (1969), Muff Fuzz (1970) and the Companion Fuzz (1971). There is an output volume knob, a tone knob and the octave knob which allow to set the amount of octave. The central switch allows to activate or not the octave, so you can have the fuzz with or without octave. You can also have the octave on a clean sound ! 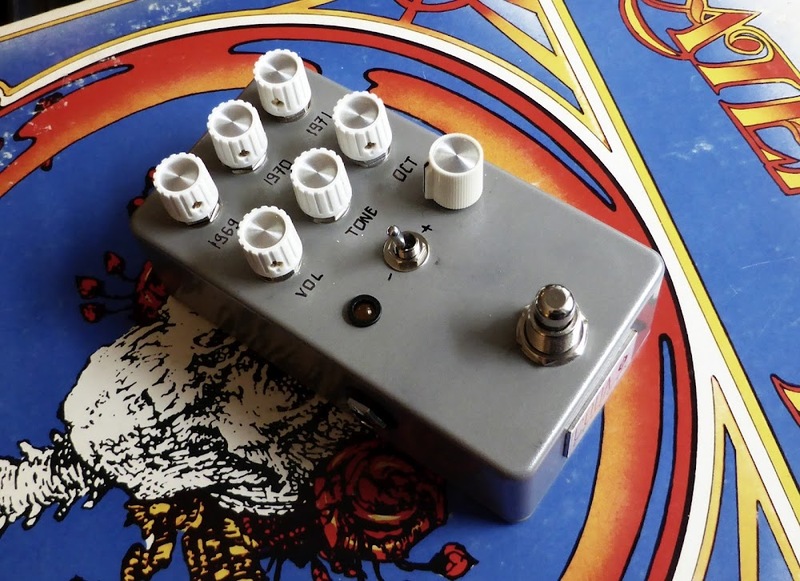 The last "pot" is a 4 positions switch that allow you to choose between clean and the 3 fuzz. I also added my relay bypass system for soft switching and silent switching. As you guessed it is a fairly complex build. Moreover, I had some troubles with it and had to modify it quite a bit. I added a klon buffer before the tone circuitry, and also tried several capacitors and resistor values on several parts of the circuit. Here is the inside of the pedal, beware it is quite messy! I used a small 4P2T rotary switch to select between the fuzz. Note that there is a jack that does not fit the PCB because of this switch (facepalm). The Fuzz Face and the Muff Fuzz circuit sound quite similar. Indeed, the two circuits are really close. 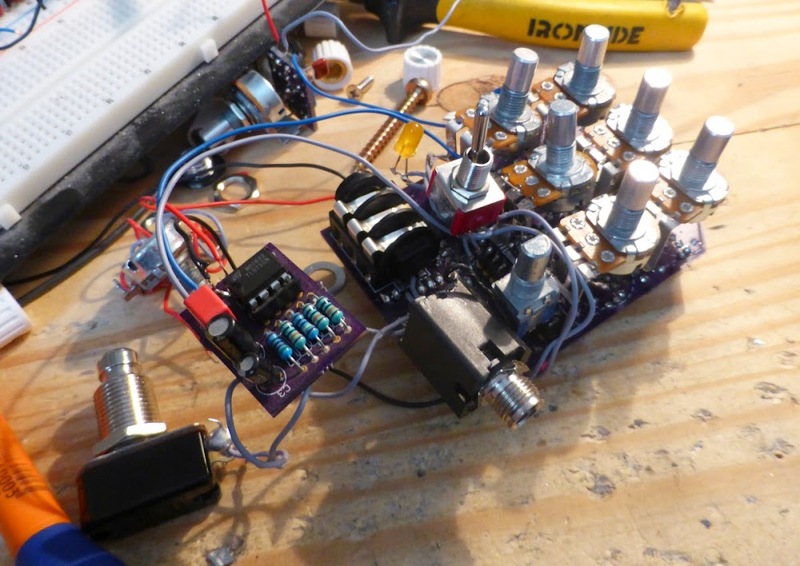 The Muff Fuzz sounds more like a silicon Fuzz Face than a Big Muff. I think I will replace it by a "mini IC muff" with a different schematic. Thus, we would really have three "flavors" of Fuzz. The volume levels between the fuzz are not similar at all. The Companion Fuzz is especially low in volume because of the tone section on the fuzz. The Muff fuzz is also slightly louder than the Fuzz Face. I added a resistor at the end of the circuit to "flatten" the final volume, but the LPB1 boost is not "strong enough" to increase the volume without distortion. The LPB1 boost will be replaced with a IC based volume section for less distortion and more output volume. This looks awesome! Maybe a version that has the octave as a stomp instead of a switch and I would definitely buy it! Might need to abandon the relay bypass or switch to a bigger enclosure to fit that though. Anyway, great idea! At first, I was indeed thinking adding a switch to it. Maybe for the 2.0 version! Just found your site, outstanding!!! So can the Green Ringer run on clean tone without adding any distortion or additional drive? I've always been under the impression it had a fuzz circuit in it as well. Thanks again for this site!!! Chouette projet! J'attends d'entendre cette fuzz avec bcp d'impatience! Comme tu dis : On est toujours un peu "a la rue" avec une seule fuzz. La, c'est l'occasion de sortir de couteau suisse de la fuzz! Et pis moi c'est la seule saturation qui me botte la fuzz. J'ai une expandora qui a un mode "chelou" qui donne un resultat sympa en terme de fuzzz, que j'ai jamais entendu ailleurs. Penses y si tu veux vraiment un element differenciant ;) Bonne continuation! 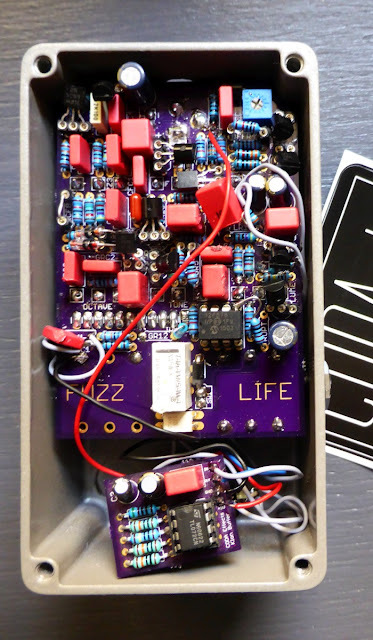 Reminds me of Beavis's FuzzLab pedal, but crammed into a tiny box!